The Digital Learning Consortium includes some of the world's largest firms, and L&D industry leaders and top academic institutions. We are recommending open standards for how we work together to use social and cognitive technologies, VR, AI, and the other emerging APIs, services, platforms - all in service to training people to gain the skills they need to succeed in the global economy. Provide a way for members to connect around the effective practices for digital learning. Determine how to plan for digital learning roles today and in the future, including Technical, Content, UX and Marketing leaders. Agree on open standards to make things simple and interoperable among designers, vendors, content and delivery systems to influence the rest of the Learning industry to align with them. Openly publicize our digital learning principles and interoperability standards. Consortium members come from corporations, academia and the L&D industry. 1. Our progress as individuals and societies is founded on our ability to learn. It is the L&D professionals who accelerate and amplify our quest to be our even better selves. 2. Whether based in firms, the industry or academia, L&D professionals craft the most effective and efficient learning experiences given one or more of these goals: providing clarity; increasing engagement; instilling skill;improving performance. 3. The essential principle of learning design is to understand the expected impact outcomes to craft the most appropriate learning offering. 4. Good learning design relies on research-based effective practices, which if ignored, result in wasted time and empty, hype-based content. 5.	Business outcomes are directly tied to the learner experience. Learning experiences should be measured in terms of how they raise awareness,transfer understanding, change behavior, and drive business results. 6. 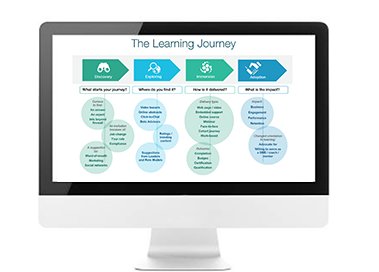 Learners want digital learning experiences that are inspiring, engaging, personalized, omnichannel and even omni-directional, impactful and ondemand. For consumers of learning, the experience is the product. It needs to be relevant, fast, aesthetically appealing and a joy to use. Learners also tend to want journeys that they, not we, determine. 7. Learners benefit from having a record of their learning; a comprehensive, easy-to-update learning portfolio helps them track not only learning experiences but the competencies embedded in those learning experiences. 8. In alignment with Design Thinking, sponsor users need to be engaged early as core members of the design team to inform designs based on the needs, expectations and experiential requirements of our learners. 9. The design process is iterative, based on observing learner behavior. Learning design is an iterative process of continual improvement driven by data and observation. Learning isn't a one-time event, but rather a continuous and evolving journey. 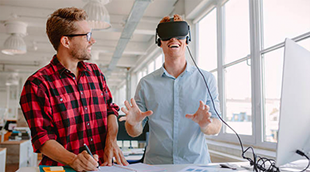 Providing immersive learning experiences, including through micro-learning techniques and extensive VR. Probing for learner preference, using cognitive techniques and creating statistical algorithms to deliver a personalized experience. Creating a single learning catalog and learner transcript store for large enterprise environments. Using simple standards to accommodate the complexity of multiple sources of learning creation and delivery. Surfacing new knowledge from disparate and unstructured sources to spark rapid and bold innovation. 11. Technology continues to provide possible new approaches and channels for learning but it is the learning designer who guides the design process so that the result meets the given need.